CoolGear's new USB 3.1 USB-C hub incorporates 5 USB Type-A and 2 USB-C reversible ports downstream and 1 USB-C Upstream port. 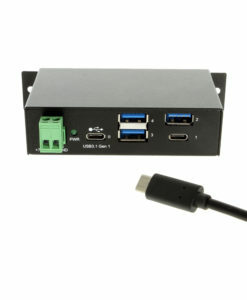 A great hub choice for applications that need 5Gbps data speeds and multiple mounting options, Includes Power Adapter! Incorporates (1) USB-C upstream port. CoolGear’s new USB-C 7 Port Hub that is USB3.1 Gen1 specifications compliant, includes a metal constructed chassis, multiple mounting options, and a power adapter. This USB-C Hub is an excellent choice for your USB 3.1 Gen1 applications, it delivers up to 5Gbps and provides 1 USB-C Upstream port, 2 USB-C, and 5 USB-A downstream ports. The USB-C hub is surge protected and backward compatible with USB 2.0/1.1 compliant host using its RISC-like USB controller. It provides a unique self-power mode to work with wide range (+7 ~ 48V DC) input DC power from its terminal block (includes power adapter). It supports fast USB charging specifications by turning its downstream ports from a Standard Downstream Port (SDP) into Charging Downstream Port (CDP) or Dedicated Charging Ports (DCP). This USB C hub does not support power delivery to devices but does support the battery charging specifications Rev. 1.2.